John Notarianni is the host of “Weekend Edition” at Oregon Public Broadcasting. 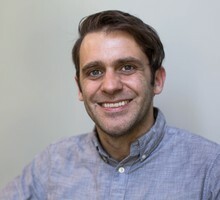 Before joining OPB, John worked as a radio producer, reporter and host at WDET in Detroit and WYPR in Baltimore, and had stints at WBEZ in Chicago and WUOM in Ann Arbor. Along the way he’s worked as the Michigan editorial director for an urban development news startup, served as business development director for several Detroit-based social entrepreneurial companies, founded a brass band that toured Europe and honed his craft cocktail skills. John graduated from the University of Michigan with a degree in English and Global Media Studies. Hillsboro-based Laika is a world leader in the art of stop-animation filmmaking. "Missing Link," the studio’s fifth feature film, is their most ambitious yet. Rob Nelson was a pitcher for the Portland Mavericks. A bullpen conversation led to the creation of Big League Chew, the bubblegum that's sold over 800 million pouches. Bunkers which used to store bombs, VX nerve agent and mustard gas could soon be back in local control — and become one of Eastern Oregon's most sought-after redevelopment sites. After 22 years in business, Widmer Brothers Brewing closed their North Portland taproom this week. So what does it mean for Widmer — and for Portland’s vibrant craft beer scene? A new proposal from the Trump administration could dramatically change the way the government cleans up radioactive tank waste at the Hanford Nuclear Reservation in Washington. Thousands of crows flock to Portland's park blocks each winter, darkening the sky at dusk and roosting overnight in the city's trees. Much about the crows' habits is unknown. As 2018 came to a close, OPB "Weekend Edition" host John Notarianni spoke with several OPB reporters about the stories that stuck with them this year, whether they were moved, inspired or shocked. Alter Wiener was a Holocaust survivor, who was killed earlier this month crossing a street in Hillsboro. He had developed a close friendship with a Lake Oswego teen in pushing for education reform. Portland is often celebrated as a transit-friendly city, but how does it stack up against the transportation systems in other U.S. cities? A new book points out what's working and what's not. Oregon-based Dark Horse Entertainment recently announced a major global partnership with a Chinese investment firm to finance new film production and expand into Asian markets. The House Agriculture Committee announced a tentative deal Nov. 29 on the massive federal farm bill. Final negotiations over the legislation have focused not on farms but on forests. Every year, gourd enthusiasts gather for the West Coast Giant Pumpkin Regatta, where participants racing across the Tualatin Lake of the Commons in kayaks made of — yes — giant, hollowed pumpkins. Once wildfires are finally extinguished across the west, another threat lingers: the burned landscapes provide an opportunity for invasive species to thrive, forcing out essential native plants. Now in its 20th year, the Portland-area's Pickathon music festival has risen from ramshackle beginnings to being a major event. But maintaining it's charm without breaking the bank in an era of mega-festivals hasn't been easy. The new U.S. ambassador to the European Union is a Seattle-based hotel magnate with deep GOP roots. In 2003, a botched experiment by agribusiness giants Scotts Miracle-Gro and Monsanto unleashed a mutant strain of creeping bent grass across Oregon. The new film by filmmaker Gus Van Sant is a look at the life of irreverent Portland cartoonist John Callahan, his struggles as a quadriplegic and his recovery from alcoholism. At its peak, Blockbuster Video had more than 9,000 stores. But starting next week, there will be only one left in America — and it's in Bend.